1. Customer Energy Usage Data: " Customer Energy Usage Data" means measured energy usage that does not identify the customer to whom the energy usage information relates. 2. Website Use Information: " Website Use Information" means the information our servers automatically record when you visit or use our Site, such as your IP address, the type of browser you are using and its settings, the third party website you visited immediately prior to accessing our Site, the operating system you are using, the domain name of your Internet service provider, the search terms you use on our Site, the specific Site pages you visit, type of product selected, site brand, order and product identifications, and the duration of your visits. Like many websites, we use, and allow certain trusted Third Party Providers to use "cookies" and other tracking technologies (such as web beacons, pixel tabs, etc.) (collectively "Automatic Data Collection Tools") to obtain certain types of information when your web browser accesses our Site or, to transfer pieces of information to the hard drive of a user's device, or to enable our systems to recognize your browser, and to provide convenience and other features to you such as recognizing you as a returning or frequent user of our Site. We allow our trusted Third Party Providers to utilize Automatic Data Collection Tools for analytic or marketing purposes. Some of the Automatic Data Collection Tools we use are associated with your account with us (including Personal Information), and others are not. We may use "session cookies" (cookies that last until you close your browser) or "persistent cookies" (cookies that last until you or your browser delete them). A. Accessing and Updating Your PII: It is important that the PII Direct Energy holds about you is accurate and current. As such, it is imperative that you keep us informed of changes to your PII. 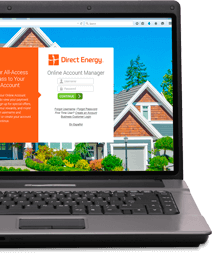 If you want to know what PII Direct Energy holds about you or wish to change PII that is inaccurate or out of date, please contact us at privacy@directenergy.com or you can access your information from your online account portal . It may not always be possible to completely remove or modify information in our databases, although we will make reasonable efforts to do so upon your request. You may learn more about your rights under California's privacy laws at https://oag.ca.gov/privacy . *Direct Energy is comprised of a collection of companies under Centrica US Holdings, Inc., and Direct Energy's wholly-owned direct and indirect subsidiaries and affiliates within the United States.